One year I had a particularly challenging group of third graders in terms of classroom culture. They just did not get along. They frequently treated each other unkindly. There were, of course, a few ring leaders, but it seemed like many of the other kids just kind of went along. We put a small copy of the picture above on every student’s desk. We encouraged students to think about their words before they spoke, especially when talking about another person. 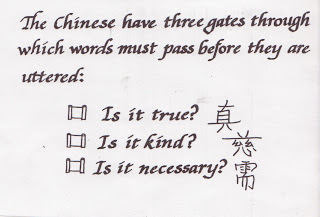 The statement should pass all three gates before it is spoken. We read There’s a Boy in the Girl’s Bathroom by Louis Sachar outloud to the class. If you are not familiar with this book, give it a read. Sachar does an amazing job of telling the story of how a rejected child finds acceptance. Every time I read it, I tear up when Bradly finally gets his first gold star. We started the “I Saw You Do Something Good!” program, which was basically small forms that students could fill out when they witnessed a classmate doing something nice. Teachers could also fill out the forms. All the forms went into a jar, and a few were picked each week for small prizes. Each student also got to keep all their forms from other students. We role played positive solutions to common classroom problems. In PE we played cooperative team building games to help students learn to work together. This had varying success. Sometimes it worked remarkably well. Other times, students argued about strategy or unfairness. We soon learned which games to avoid. At the same time, we steered clear of competitive games both in PE and in the classroom. Do you think you are a good friend? Why or why not? You and your friend both want to do something different on Saturday afternoon. How can you solve the problem? What are three things you can do to make new friends? I actually love a good art project, but for that year we made coupon books. Each student came up with their own coupons for nice things they could do for their parents. Most of these ideas could be integrated into our normal school day and curriculum, so we really didn’t have to spend much extra time “teaching friendship.” For the most part, it worked. Our classroom did become a kinder place. There was one girl who, as far as I can tell, was immune to all of it. Although she continued to be a challenge, she did become less popular with her peers, which lessened her influence. 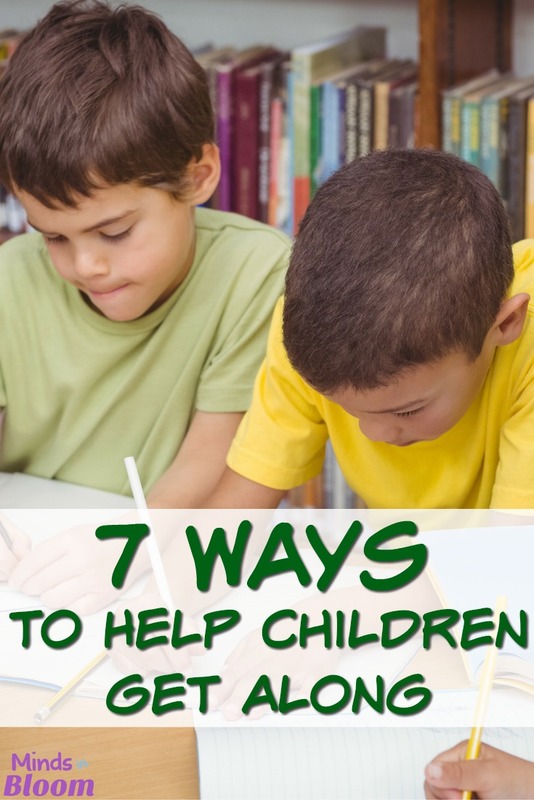 The Rejected or Neglected Child in Your Class Teach Your Students to Set Their Own Learning Goals and Boost Learning 10 Ways to Help Struggling Students Grow Helping Children to Make and Keep Friends in Your Classroom FREE Social Skills Friendship Cards! Nice post. I just asked, and my wife doesn't recall hearing the three gates criteria in China–she was born and raised in China–but it's a big country, perhaps it's a regional thing. But it is a nice strategy anyway, in my view, one that I intend to talk about with my son. Regarding the avoidance of competitive games, I don't know what to think. My son is in third grade right now, and I have been encouraging him to try to be kinder, as he is highly self centered at this stage of his life. Due to his self centeredness, I have been having the some of the same problems with him that you describe in your class. Back to competition, though…most boys like to compete. It is in their nature, IMO. Who is the fastest, strongest, smartest, etc. Most girls like to cooperate, IMO. It is in their nature. My daughter could care less who wins when we play a game of chess–she just likes playing the game. I am an not an expert, but I guess I would like to see competitive games also be offered at various times in my son's and daughter's classes, so that the boys can learn to compete in a way that is constructive, and girls can learn to enjoy healthy competition as well. That is, I don't personally think competition is bad, though it can be done badly. And if we are going to teach the boys to be more cooperative, it's only fair to teach the girls to compete. Competition and cooperation are necessary skills as an adult, for all genders, after all. Thanks so much for your very thoughtful comment, some interesting things to think about especially in terms of competition. I have a very small class, one which keeps getting smaller because of the social dynamics. I am trying character education. I am trying a class motto "Peace starts here." But I think I am going to try the idea of the three gates. Most of the conflict within my room is coming from the comments made from children. However, what do you do when they don't even know that it is their comments that are hurting others. I have tried parent outreach (w/o pointing fingers). Children repeat what they hear. f the parents know no boundaries then neither do the children. I like the idea about the gates. I'm a school counselor who wandered onto this site looking for ways to help 3rd grade girls get along. I'm going to use this idea today in a class. Thanks!